As a cataract slowly begins to develop, you may not notice any changes in your vision at first. But as the cataract progresses, you may begin to find that it interferes with your daily activities. Performing a complete eye exam, one of our ophthalmologists (Eye M.D.) can tell you whether cataract or another problem is the cause of your vision loss. A cataract may not need to be removed right away if your lifestyle isn't significantly affected. In some cases, simply changing your eyeglass prescription may help to improve your vision. Contrary to popular belief, a cataract does not have to be "ripe" to be removed. However, once you are diagnosed with a cataract, your ophthalmologist needs to monitor your vision regularly for any changes. You and one of our ophthalmologists can discuss the cataract surgery procedure, preparation for and recovery after surgery, benefits and possible complications of cataract surgery, cataract surgery cost and other important information. Together, you can decide if cataract surgery is appropriate for you. The only way to know for certain if you have cataracts is to have a dilated eye exam (where your pupil is widened with eye drops). 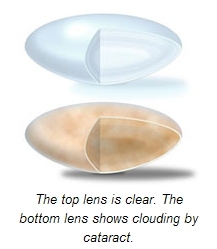 One of our ophthalmologist can detect early signs of cataract development by looking at your eye's lens. Get a baseline exam at age 40 when early signs of disease and changes in vision may start to occur. One of our ophthalmologists (Eye M.D.) will let you know how often you should return for follow-up exams. At any point, if you have symptoms or risks for eye disease, see your Eye M.D. Because your risk for cataracts and other eye diseases increases as you get older, starting at age 65 you should see your Eye M.D. every year. A complete eye examination will rule out any other condition that may be causing blurred vision or eye problems. Early detection and treatment of cataracts is critical to preserving sight.